SMTP servers forms an integral part of the web platform. Business entities are making the best use of this email propagation server. Whether you are using the PC, the laptop or the android mobile, the role of SMTP is definitely worth mentioning. The servers are specifically designed to reach your much valued email at a desired destination. Did you know that most companies making use of SMTP servers alter the settings of the later just to ensure authenticity and safety is maintained? So why do you think entrepreneurs take such a step? This is simply because there are hackers and spammers who unduly take advantage of the company server to send spam commit other unauthorized deeds. Being a businessman it is essential that alter the default settings to a personalized one, so that one will be able to access your SMTP server. Who knows you might even find it difficult to access your local network, which vital. Most often users fail to realize if the SMTP is working on the matching server where service is provided. If the SMTP is able to secure the 220 response then it is clear that the former is actually making use of the right route. The SMTP system is basically text based allowing sender-receiver communication. The process takes place through commands and data supply. A session across the SMTP server is inclusive of commands set by the sender followed by responses which is also caused by the server in function. The transactions that take place in between the transaction can be zero or many. While connecting with the port 25, the sender is required to wait till the entire connection is accepted by the receiver. The transaction is also referred as Handshake. After establishing connection between two servers the individual is free to set in the address for answering the mail message. Any error occurring during the process is to be reported to the desired address. After setting the recipient’s address, the details of the address are incorporated. 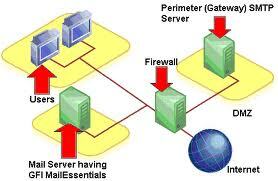 After the address is set the message is sent with the help of the software system allotted for SMTP usage. If the mail reaches the desired address, the server sends an Okay code just to confirm that the transaction has taken place successfully. You must know the fact that all details and data sent across the SMTP server are disposable. If you don’t close the transaction you may lose details of the transaction, as the server may fail to record them or store them unless you have taken the proper action. You have to ensure that the connection is closed appropriately.